I can’t believe what a response there was to my last post about the light bulbs. This appears to be a subject that strikes a chord in many people! Shelly sent me information about this article in the New York Times. The reports experimented with different bulbs and types to see what most people preferred. Good old incandescent came out way on top — even against the warm white cfl’s. After much soul searching a bit of thought, I’ve decided to stick with the standard bulbs for now. As well as disliking the light that the cfl throws off, there’s the issue of how to dispose of the darn thing because it contains mercury. I don’t want to be putting more mercury in the environment. That seems as harmful as using more electricity. Plus, it appears that all of the manufacturers are coming out with energy-saving incandescent bulbs that will meet the new government standards as well as being a much nicer light. And new technologies are coming. So I will leave my one cfl in the kitchen. But I doubt I’m ever going to like it. On a totally different subject, here is as far as I’ve gotten on the clown-barfish socks — sorry, but I just can’t think of these as anything else now. This picture was as of this morning, so you are as up to date as possible. My current sock class was polled for their opinion. It was a pretty universal thumbs-down. I am continuing to knit them, however, because one person who saw them exclaimed, Oh! What gorgeous colors! Those are so evocative for me! Since it turns out that the gauge is a little off for me, but appears to be just the size to fit the exclaimer, she is obviously fated to be the recipient. I’m thinking short-row heels on these. 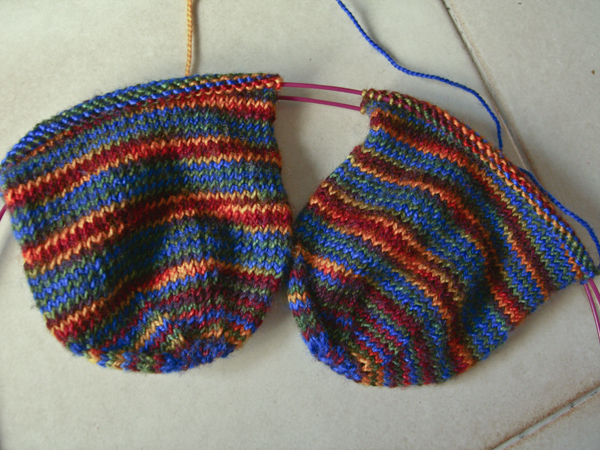 Or maybe flap-and-gusset but knit with the opposite end so as not to mess up the striping.